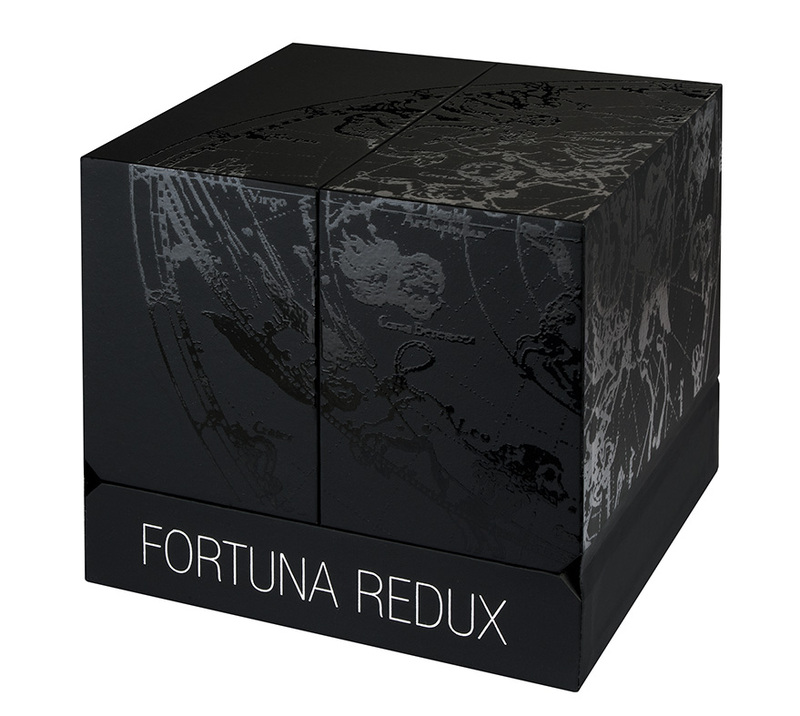 For us, one of the finest releases of 2013 was the stunning ‘Fortuna Redux’ silver coin released by the Mint of Poland. 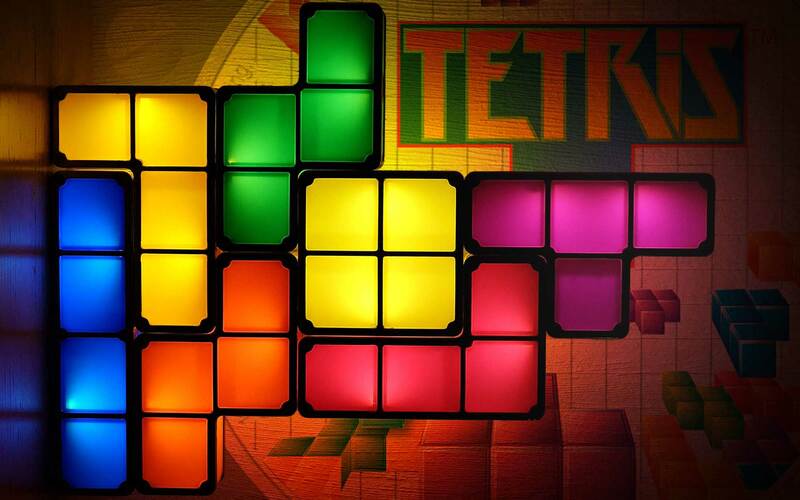 Becoming an instant hit, this six-ounce masterpiece had a limited run of 2,500 pieces and sold out quite quickly. It did suffer from one problem however, it wasn’t cheap. While understandable given the size and workmanship, there were undoubtedly more people that wanted the coin than could buy it. Fast forward to 2014 and an opportunity to own one has now appeared in the form of a three-ounce version. 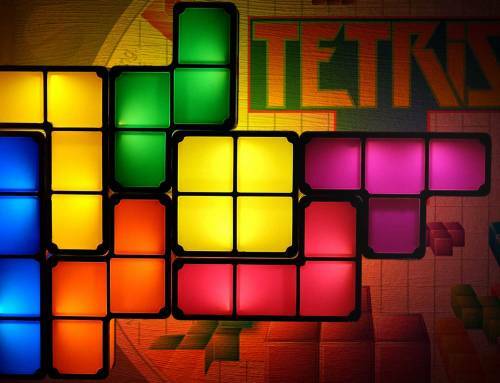 Carrying the same artwork and design that made the original such a hot item, it’s fairly likely that the 2,014 pieces to be minted won’t hang around long and has given collectors another chance to grab this great piece of art.. The Fortuna Redux was an ancient Roman tradition first introduced in 19 BC to mark the return of the great Emperor Augustus from Asia Minor. Fortuna Redux was widely disseminated in the Western Empire as the tutelary of the emperor’s safe return to the city when he traveled abroad, an event that reaffirmed Rome as the center of the Imperial world. The concept widened to include thanks for overseeing the return from a long or perilous journey, many of which involved business. 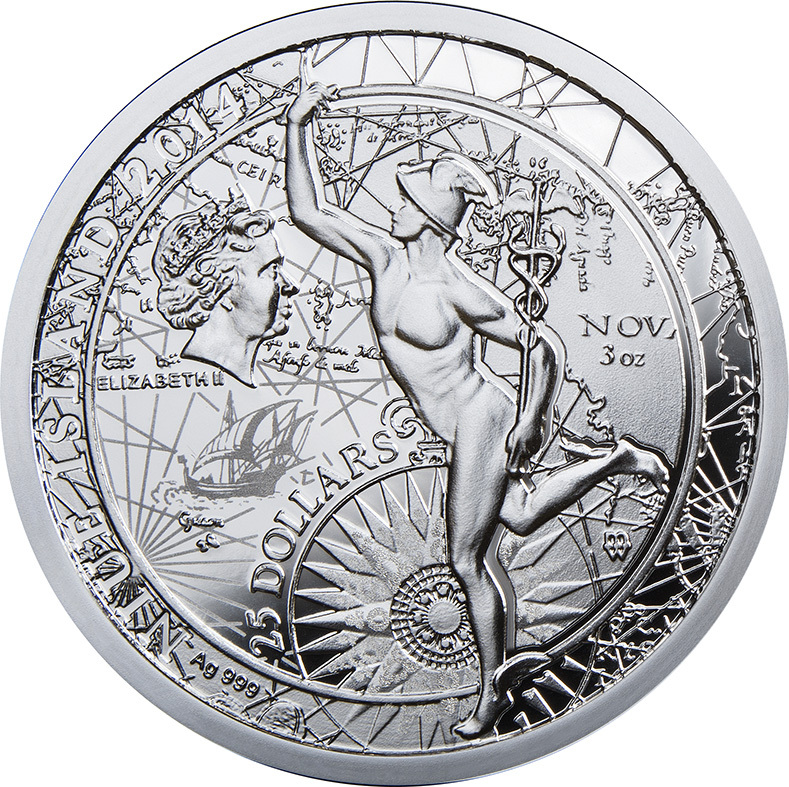 The coin depicts the Roman God Mercury, the patron god of financial gain, commerce, eloquence (and thus poetry), messages/communication (including divination), travelers, boundaries, luck, trickery and thieves. In other words, a perfect fit for the Fortuna Redux. Mercury had essentially the same aspects as Hermes, wearing winged shoes (talaria) and a winged hat (petasos), and carrying the caduceus, a herald’s staff with two entwined snakes that was Apollo’s gift to Hermes. Mercury was also considered a god of abundance and commercial success, and archeological evidence from Pompeii suggests that Mercury was among the most popular of Roman gods. The god of commerce was depicted on two early bronze coins of the Roman Republic, the Sextans and the Semuncia. 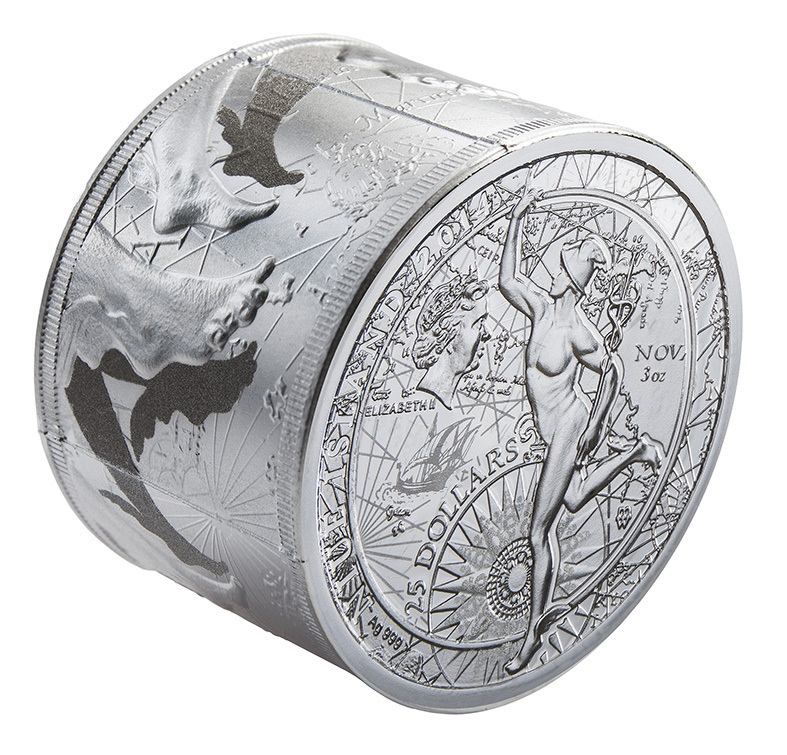 Designed by Polish artist, Urszula Walerzak, the transition from six to three ounces in size has been handled with ease and the coin remains a fantastic object. The obverse (above-right) carries an image of Mercury, next to it an effigy of Her Majesty Queen Elizabeth II and the face value: 25 DOLLARS. In the background – a map of the world with elements symbolising travelling. 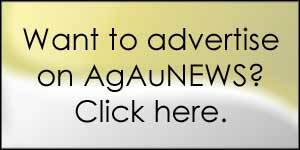 Along the rim – the inscriptions: 2013 (the year of the issue), NIUE ISLAND (the issuer), Ag 999 (the alloy). 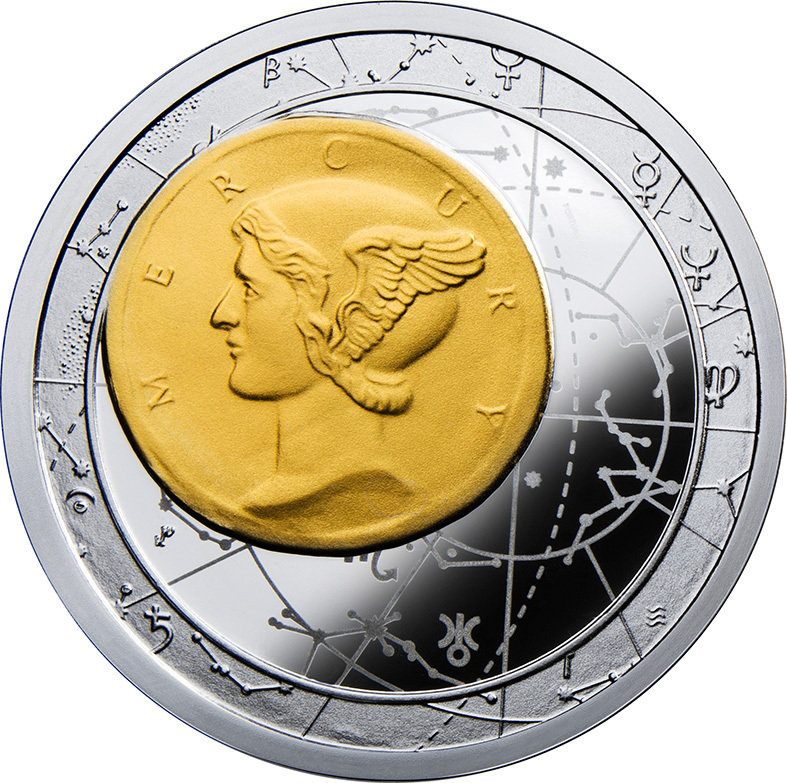 The reverse shows an image of a gold coin with the effigy of Mercury, in the background – a map of galaxy. 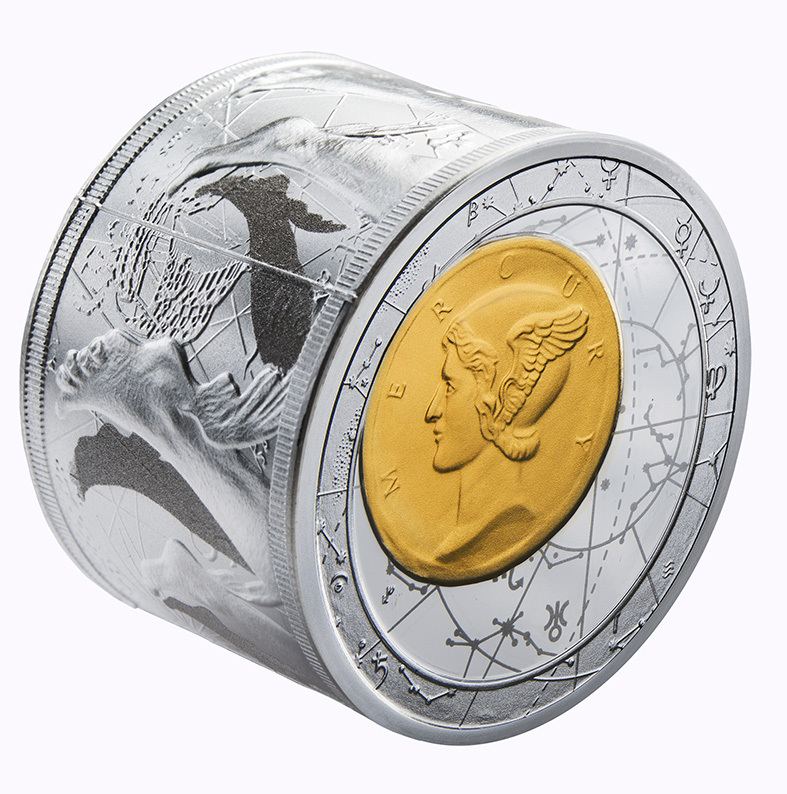 The packaging replicates that of the original coin and is quite superb, allowing the coin to be seen from almost all angles.. We have a six ounce coin and can imagine that it would make a simply awesome gift to seal a business deal. There is a Certificate of Authenticity included, but they aren’t numbered. There’s a portion of coin collectors who constantly denigrate the price of commemorative coins, equating the weight of a piece with it’s value in much the same way as a bullion coin. It’s a superficial and quite ridiculous argument predicated on the assumption that they’re only a store of precious metal value. 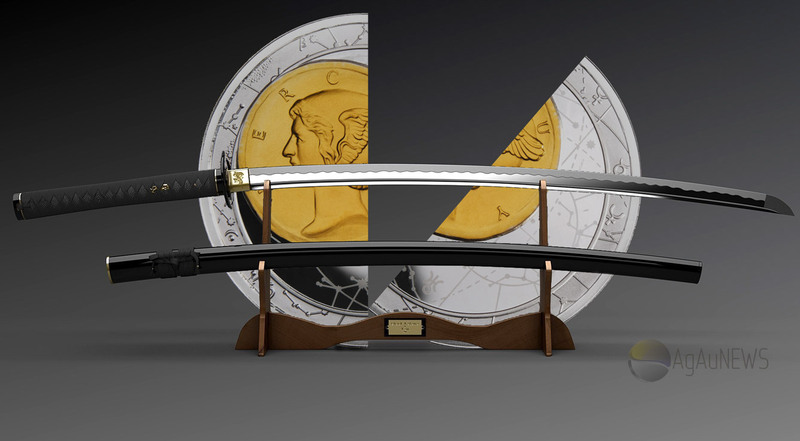 Rather than debate the argument, take a look at the video below and look with awe at the sheer amount of artistic energy and technical design that goes into a product such as this, all the while bearing in mind that only 2,500 of those coins were ever minted. 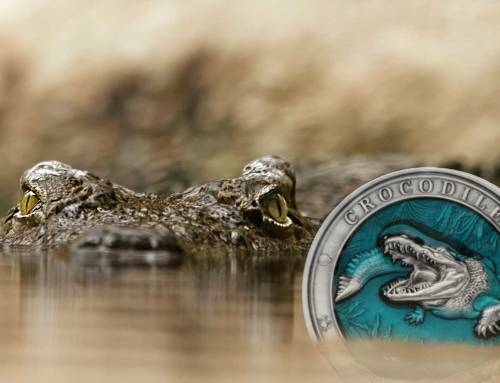 If after viewing you still don’t understand why a six-ounce coin cost more than six ounces of silver bullion, you’re looking at the wrong kind of product for you. 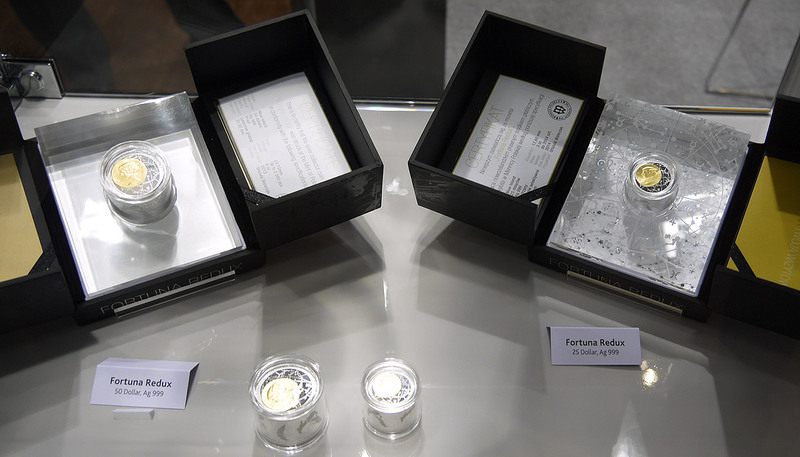 For comparison we took a photograph at the recent World Money Fair in Berlin of the new coin side-by-side with last years six-ounce version. If anything, the packaging is even better on the 2014 coin. 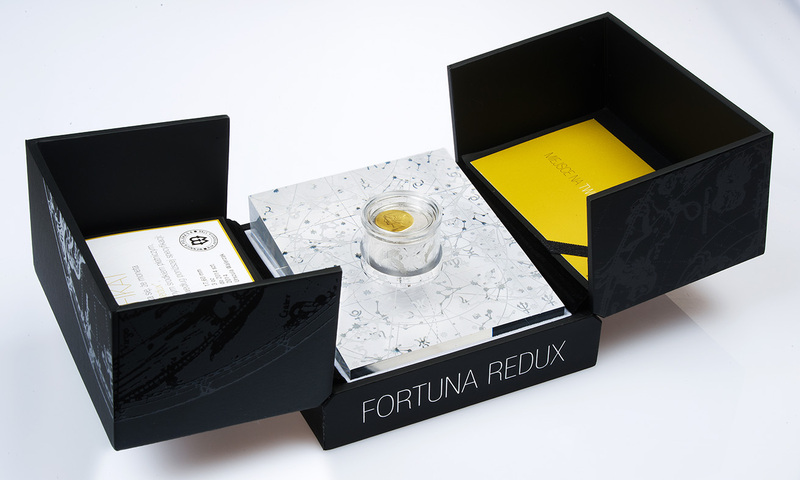 Both Fortuna Redux coins are great coin to collect. I call 2013 Fortuna Redux ( Fortuna Redux Senior) and 2014 Fortuna Redux (Fortuna Redux Junior). I just received the 2014 version today. I spent at least 30 minutes going over every detail. I don’t think I could ever sell this. The workmanship,thoughtful design…just makes it feel special. I love the meaning infused with the coin…a return of fortune, and a safe return home (usually for military; which had personal significance). I actually like the 3 oz coin more. I do wish the mint had numbered the COA, but the packaging is phenomenal. 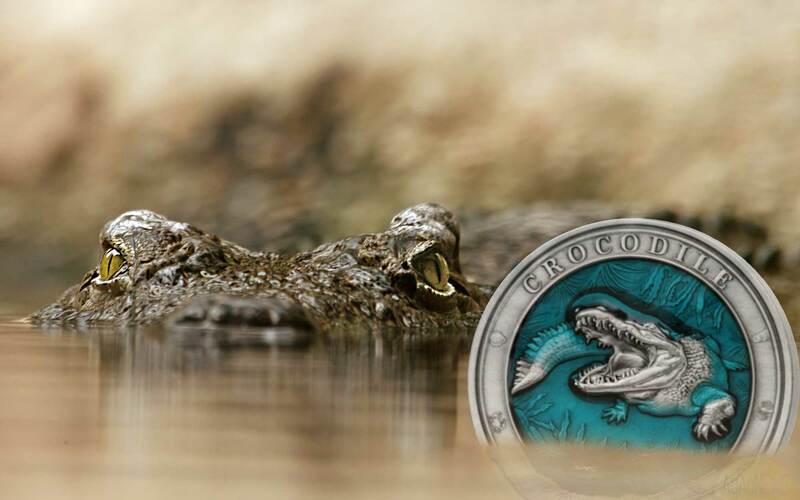 2014 has been a very good year for some amazing coins.